How to maximize your tweets. 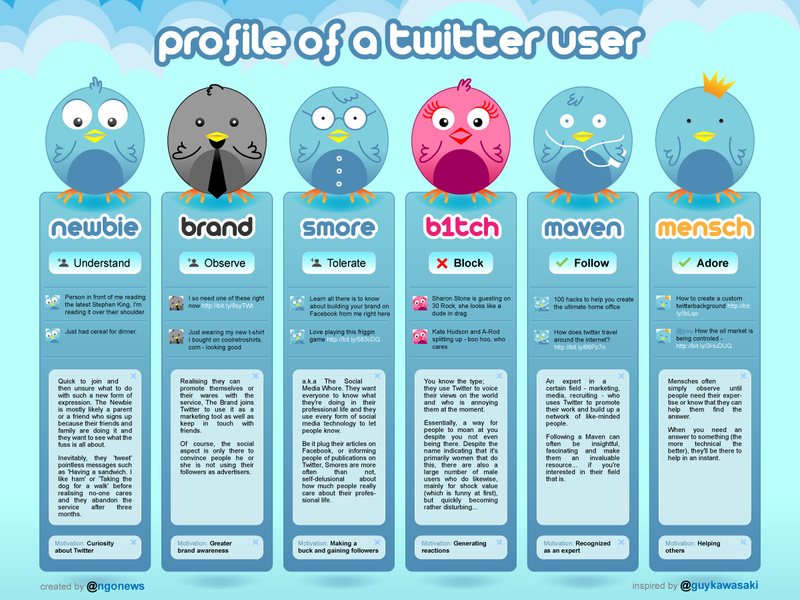 Great infographic showing how to maximize your tweets. This includes. Buddy Media’s full report can be found at http://bddy.me/twitterdatareport. How to maximize your TWEETS, in 1 picture ? Scheduling tweets and updates is a fantastic way to make sure you are getting valuable content out to your audience around the clock — even when you’re sleeping! Using third-party tools like MarketMeSuite allows you to schedule your tweets for specific dates and times. This can help you stay on top of your social media content promotion. Scheduling tweets can also be helpful if your business extends to a global audience. Bufferapp.com recently published a study that showed carefully selected times for scheduling tweets increased click rates by 200%. Use TweetWhen.com to help you determine the best times to tweet. There is no better way of knowing whether your tweets are being read than by analyzing your data. Use a third-party application to monitor your Twitter presence and understand how people are engaging with your tweets. You can determine if your tweets are getting seen and provoking conversations and discussions. Is one type of tweet getting retweeted or generating more clicks and discussion than others? To track a particular marketing campaign you’re running, create and promote a particular hashtag. Using hashtags allows tweets about a particular subject to be more searchable by users. After the campaign is over, marketers can search for the hashtag and identify how effective it was in promoting the campaign and generating more tweets. Monitoring your retweets is also a very effective way to see not only who has read your tweets, but also who found them interesting enough to retweet them. Connecting your blog’s RSS feed to your Twitter account will allow your Twitter followers to receive tweets about your newest blog content automatically. These feeds encourage maximum exposure and save you the time of manually promoting your blog content to your Twitter followers. Just be sure your Twitter feed doesn’t turn into an automated stream with no Twitter interaction. Participate in the conversation that evolves from the content you’re tweeting, and always make sure your Twitter account is about more than just content promotion. By tweeting questions, you’ll be inviting followers and other Twitter users to interact, converse, and engage with you and your brand. The more engaging and valuable you make your Twitter stream, the more followers you’ll generate. Something as simple and easy as asking “What do you think of ABC?” or adding, “We would love to know your thoughts about XYZ” at the end of an update will encourage responses. Conversely, remember that if someone asks you a question in real life, you tend to respond it automatically. Think like a human being when you tweet, and be responsive, too. 5. Be Personal, React, and Engage! It’s extremely important to make sure your followers know there is a real human behind your tweet. If you tweet like a robot with no level of personal engagement with your audience, your Twitter account will look like spam, and your followers will get bored with your messages. Use personal touches in your tweets now and then. The more you engage with your followers on a personal level, the more they’ll understand you care about, and the more willing they’ll be to connect with you and build a relationship. As a result, they’ll grow to trust you, listen to what you have to say, and be more receptive to your marketing messages. The original post is written by Nikki Peters, community manager of MarketMeSuite. The concept of ‘getting Twitter’ is important. There are still billions of people out there who don’t understand what Twitter is, don’t care what Twitter is, or, worse, both. It’s the evolution that these individuals go through that you can read in this article. Denial is the first thing that most people feel about Twitter. They’ve decided that it isn’t for them. They’re far too busy, and Twitter is a waste of time. They’re already on Facebook, after all – and they hate that, too. And look what happened to Myspace. Why make the effort? Twitter, Twitter, Twitter. That’s all the newspapers ever talk about! Who cares what some celebrity said to another on Twitter? Who cares what people are tweeting about when American Idol and The X Factor are on? Who cares about these super-injunctions? Who cares that Twitter broke the news before anybody else (and that several people took on-the-scene photos, too)? Twitter, Twitter, Twitter – enough already! Finally, they cave, and begrudgingly open an account, mostly to appease friends, or perhaps because Twitter is being mentioned a lot where they work. Yeah, I’m on Twitter, they say. Often they’re very active for 24-72 hours. And then completely ignore it for the next few weeks. For many this is the worst stage. They’ve finally made the effort and signed up, and now all their fears are confirmed. They were right – Twitter isn’t for them. There’s nothing to see or do. It’s like talking into a vacuum. Who are these people following me? Why are these people following me? Who should I be following? Where are my friends? Who cares what I have to say? How come I can only write tweets about what I’m eating for breakfast? What the heck is a hashtag!? Many people don’t get to this stage, abandoning their Twitter accounts somewhere between bargaining and depression. But for those that do it’s totally worth it. They keep plugging away, keep reading, keep learning, keep asking questions and keep doing it. Suddenly, the light bulb goes on. Nobody can tell you what Twitter is, because Twitter isn’t any one thing. You have to find out for yourself. Then, suddenly, it’s your Twitter. You own it. You shape it. And you get it. And baby, it’s a beautiful moment. And often those who were the most resistant, and the most critical, become the biggest evangelists. I’ve seen this process repeated again and again by friends, family, colleagues and clients. It isn’t always in this exact order – sometimes denial and anger swap places, and sometimes the depression stage is skipped entirely – but more often than not this is exactly how it goes whenever somebody walks the path from Twitter dismisser to Twitter critic to Twitter devotee. And then they go on to play a crucial role in making believers of other cynics, too.